With Father's Day right around the corner, you may still need an idea for the man in your life. Some men are downright difficult to buy for. My husband is one of those men. If he wants or needs something, he buys it for himself, leaving me struggling for gift ideas on holidays like Father's Day. Thanks to GourmetGiftBaskets.com, I now have lots of fun products to choose from! GourmetGiftBaskets.com is the perfect place to shop for Father's Day or any occasion, really! There is an amazing selection of gift baskets for every budget. If you are looking for a gift idea for any occasion, you need only browse the categories on the website. There you will find basket ideas for Birthday, Pets, Baby, Care Packages, Wedding, Get Well, Housewarming, and many more. 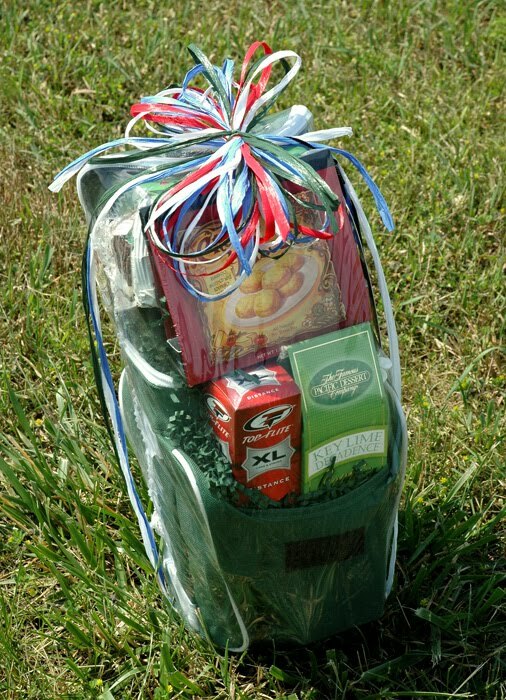 Gourmet Gift Baskets has a great selection of gift baskets for Father's Day! You are sure to find one that would be perfect for the man in your life because GourmetGiftBaskets.com makes it easy to find a Father's Day Gift Basket with over 50 different baskets to choose from! 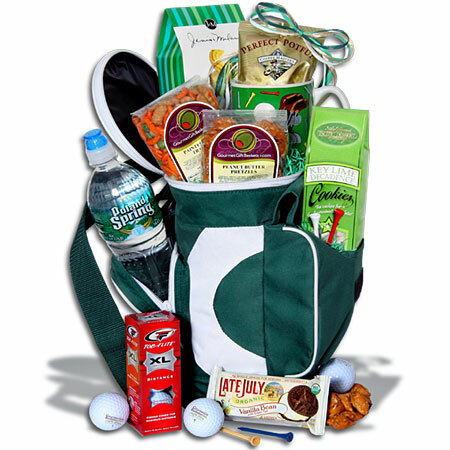 We were sent a Hole in ONE Golf Bag™ - Father's Day Golf Gift Basket to review. This is a perfect gift for my golfer husband! I considered waiting to give it to him on Father's Day, but I decided to share this post a little early in case some of you are still looking for Father's Day gift ideas. · Hole in One Golf Bag Cooler - Exactly; it’s a cooler. This item from our golf gift baskets is something that he is sure to hang on to for years to come. · Golf Balls Sleeve of 3 - These PGA-quality balls are sure to keep Dad busy on the course. · Key Lime Decadence Tea Cookies by The Famous Pacific Dessert Co. - 5 oz. - Dads, golfers, and dad golfers alike love these deliciously sweet and citrusy cookies. · Painted Desert Trail Mix by GourmetGiftBaskets.com - 8 oz. - Make sure Dad does not go hungry on the course with this robust selection of southwest themed snacks. · Asiago Cheese Straws by J&M - 2.5 oz. - These Asiago cheese snacks are favorites of many of our customers. · Vanilla Bean Sandwich Cookie by Late July - 1.5 oz. - These cookies consist of two chocolate wafers separated by a sweet, creamy vanilla frosting. · Bag of “Perfect Potful” Coffee by Coffee Masters - Reward Dad for all of the times he woke up early in the morning for your betterment with this gourmet Arabic coffee. · GourmetGiftBaskets.com Peanut Butter Pretzel Nuggets - 4 oz. - These sweet and nutty nuggets won’t last long! · Golf Mug – This stylish, sturdy mug will be around long after he has devoured all of the wonderful snacks in these golf gift baskets. · Poland Spring Sport Top Bottle - This bottled water is as refreshing on the course as it is after mowing the lawn, so we thought we would go ahead and include it in our line of Father’s day gifts. · Golf Tees - They get launched, broken, and forgotten which is why golfer’s always need extra golf tees. 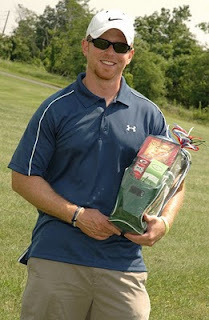 If you are still looking for the perfect Father's Day gift, or any gift at all!, check out GourmetGiftBaskets.com today! GourmetGiftBaskets.com is very generously giving away a Golf Gift Basket - Hole in ONE Golf Bag™ to one lucky living life one day at a time reader. 1. To enter, simply become a fan of the GourmetGiftBaskets.com Facebook page, http://www.facebook.com/gourmetgiftbaskets. 2. After you become a fan, post on their wall about one of the products you like on their website and then leave a comment here that you have completed the submission. 1. For FIVE extra entries, blog about this giveaway with a link back to living life one day at a time (http://colleenstearns.blogspot.com/) and GourmetGiftBaskets.com (be sure to post the url to your post here in a comment so I know where to find it). 6. Follow living life one day at a time on Twitter AND Tweet about the giveaway. Leave the URL to the Tweet in your comment. You can tweet once a day, but remember to leave the URL to each tweet. You can tweet "Enter to win a Father's Day Gift Basket from @livelifereviews and GourmetGiftBaskets.com http://tinyurl.com/25gn9kp #giveaway " Make sure to leave a link to your twitter message in your comment. You can do this once a day. Please make sure to come back each day and leave another comment with your new twitter message link. This giveaway is open only to US and Canada entries. There was no monetary compensation received for this review. I received the Father's Day Golf Gift Basket for the purpose of completing this review. Receipt of this did not sway my opinion. Left comment on GGB FB wall. I'm a fan of GourmetGiftBaskets.com on Facebook user Lisa G. and left a comment on my favorite basket on their wall.